Home > News > Beerfest > Why did you become a Brewer Richard? “I was thirsty”. Meet Black Donkey Brewing. Inec Inec Why did you become a Brewer Richard? “I was thirsty”. 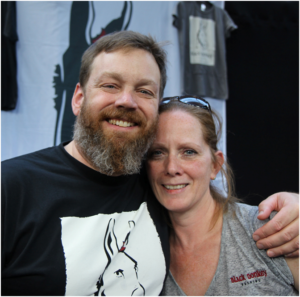 Meet Black Donkey Brewing. Why did you become a Brewer Richard? “I was thirsty”. Meet Black Donkey Brewing. Based in the heart of Roscommon award winning brewery Black Donkey Beer Richard And Michaela returned from New York to set up shop in Ballinlough and thank god they did! How did you become a Brewer? I was thirsty, and bored by the macro beers available in Ireland when I returned home from 20 years living in New York. We have adopted a policy of sustainable growth, which means we are still a small brewery, but we have virtually no debt, and our output has grown steadily from year to year. We now export our beer to Russia, The USA, The UK and more. How many products do you currently produce and what are they? We have five core range products. Which beer was your first craft beer? Sheep Stealer; Irish Farmhouse Ale. It was the first saison style beer produced commercially in Ireland. Today it accounts for about 60% of our output. It is shipped to all of our export markets. What is you most recent product development? TKO, IPA is the latest addition to our line up. We may be well known for our Belgian influenced brewing, but we also love hops and like to drinl IPAs, so we decided to add pne to our lineup in early 2017. How do you decide on new beers to brew? Firstly is it a beer we enjoy? Can we brew well?! Is it a beer we think the market wants? Can we get the ingredients we want? What’s the style most fun to brew? Sheep Stealer is probably the most fun from a fermentation perspective. The yeast we use for it is an animal, and eats just about every bit of sugar it can sink its teeth into. The fermentation cycle is literally wild! If there were a beer that you could brew with no regards to cost or production or sales, what would it be and why? There’s nothing we wouldn’t like to brew, but a great Belgian Golden Strong Ale is high on our future list. It’s unlikely to be a big seller, and it would be expensive to produce well but, it’s a great drinking style, and it would be a real test of our skills and our equipment. It may be a good trial for Arigna 2017. If you’re not drinking your own beer, what’s your favourite to drink? That’s hard to say, there are so many great Irish and International beers available nationwide right now. What we like at any given time is usually influenced by where we are, what we’re doing and who we’re with. We appreciate all well crafted beer. What’s your favourite food to eat with beer? All Food!! We pair food with beer, not wine. It’s what we know it’s what we grow, it’s what we do. Ireland’s barley harvest is far more important to the economy than its grape harvest. We believe that beer is food, and that it is a far more appropriate meal pairing in the majority of circumstances than wine. All that said, we love great beer with great barbecue, steaks, spicy dishes, wild game, chocolate, pizza, pasta, whatever……..
What are the biggest impediments to the growth of craft beer? Poor distribution. Standardisation and acceptance of a “pay to play” business model, created and fostered by the macro beer manufacturers who can afford to operate in that type of business environment. Lack of consumer knowledge of the choices available to them (that is changing though). Which other brewery has inspired you the most? Why? What is one piece of advice you’d give to someone who thinks they want to get into the craft beer industry? Now is not the right time, wait. Brewing takes patience, setting up and running a brewery takes even more. The market is over saturated right now and will take some time to settle down. Launching a new brand onto the crest of a wave is not a great idea. Are you looking forward to our Festival this month? Where can someone find your beers? Everywhere great beer is sold. If you don’t see it, ask for it, our enthusiastic consumers are our greatest sales force. More precisely, we can be found in the country’s finest independent beer sellers, O’Briens, Carryout, Supervalu, Tesco, Spar, Centra, Londis and many more nationwide.